When filling out your guest comment card from last night's victory over GW, check the box "Met Expectations" for overall experience. VCU got off to a predictably slow and sloppy start. The Rams, tipping off a mere 44 hours from the final buzzer of a physically demanding win over UMass, fell behind 8-2 and it was obvious they were giving effort to having effort. GW, for its part, established an inside presence and flew in transition. For about seven minutes, it looked like the Colonials were wreaking havoc. However once that second burst hit, the legs of the VCU players signalled their brains that they were doing just fine. No need to manufacture a phony energy. The legs were there for them. Havoc at it. So it is said, and so it came to pass. eight turnovers and closed the half on a 21-6 spree. The second half was more the second heat of the boat race. The Rams parried two GW rallies, the last of which cut the lead to 12 points. 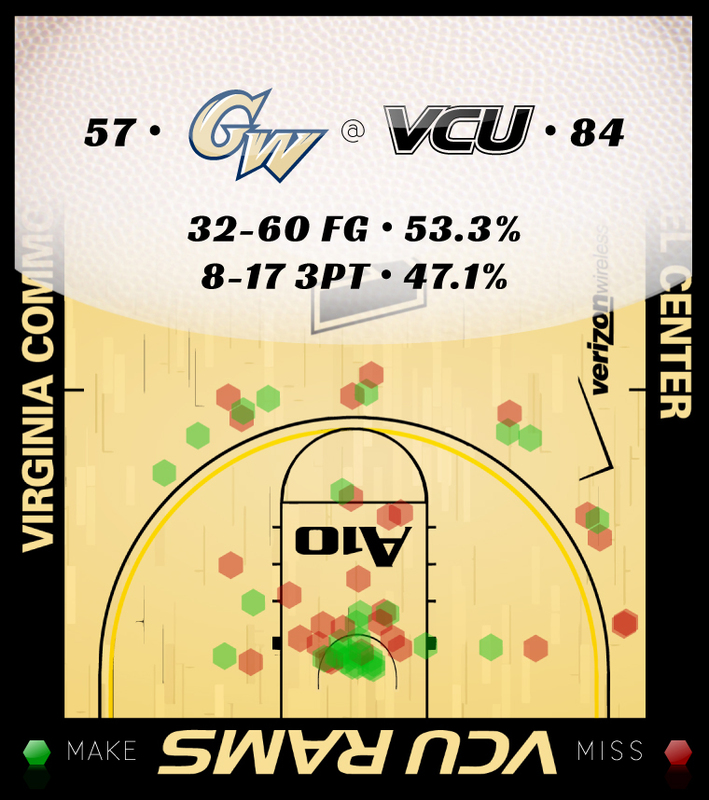 VCU responded, holding GW to one field goal from that point to the end of the game–the final 9:43 of the contest. It was a carbon copy of the first half–another 21-6 run. increased its national lead in steals to 321. And now, the battle for first place. VCU heads to Saint Looie for a Tuesday heavyweight bout. The matchup pits the two A-10 teams playing the best basketball in the conference. Hang tight, we'll get there. For now, let's finish out the GW victory. 12-15 (80%); 72-90 (80%). Quietly, the Rams are knocking down free throws at a phenomenal rate. Since going 11-19 from the stripe in the 69-61 loss to LaSalle, VCU has hit 80% of its freebies, mimicked last night. 8/8. The Colonials managed eight assists on the evening, matching the number of turnovers committed by freshman point guard Joe McDonald. Eleven. VCU moved to 13-0 on the season when Rob Brandenberg scores 11 or more points. Eh, that was about as expected. VCU committed 16 turnovers, which to me is a huge number. What's more, while the plus nine on the turnover differential is very good, we're not going to see all-freshman backcourts the rest of the season. I'm willing to let it go because it was two games in 44 hours, but I do have one concern. There isn't much greater of a turnaround prior to the St. Louis battle. The Rams played one game (Charlotte) in the 13 days between Fordham and UMass. Now, VCU gets it's third game in six days. Go figure. ***Juvonte Reddic. The dunks were fun and the double-double necessary and noteworthy, but the edge Reddic played with was even more impressive. Reddic was credited with two blocks and two steals, but I feel like he made a bigger impact than even those numbers. It was one of those games where a locked-in Reddic seemed to be everywhere. **Melvin Johnson. I asked for validation and that's exactly what Johnson provided. His 11 points (on 5-9 shooting) and three rebounds are fine, but it's Johnson's visceral impact on the team that is most striking. There's an extra pep in the step of everyone on the floor with Melvin. Johnson is one of those players whose basketball instincts are tremendous, but he also carries the personality–dare I say swag–that makes the game fun for his teammates. Honorable Mention: The Big Buddha, who clearly returned to the team ready to go. Last night it was five points and three rebounds (plus one charge taken) in seven minutes. Haley laughed a lot and even got into a min-scrum with a GW player. The way of the peaceful warrior.